"But sometimes I think my head is so big because it is so full of dreams." Philip Anglim is a native Californian from the San Francisco Bay Area. On the road to studying veterinary medicine, Philip encountered a detour when a drama teacher wanted him to appear in a play. Graduating from Yale University with a degree in English Literature, the detour led to a career as an actor. The diversity of roles that he has chosen have dealt with subjects such as cannibalism, AIDS, spirituality, & nuclear holocaust. 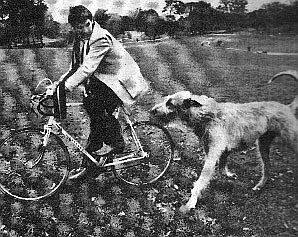 Philip and Kelty the wolfhound, out for a spin. because they are for our own good." "I planned to say so many things...I forgot them. Click HERE to view scenes from the Broadway production at the Booth Theater! "My thought is murder, yet is but fantastical..."
"False face must hide what the false heart doth know..."
"I will not be afraid of death and bane..."
"Lay on, MacDuff...damned be him who first cries 'enough'!"